PanARMENIAN.Net - Russian tennis player of Armenian descent Karen Khachanov has said he is looking forward to the prospect of facing Rafael Nadal at the Mubadala World Tennis Championship (MWTC) as the Russian No 1 prepares to make his debut at the Abu Dhabi tournament later this month, The National reports. 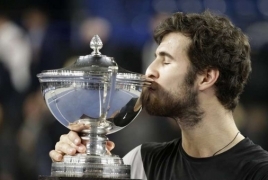 Khachanov, 22, enjoyed an impressive breakthrough season in 2018, climbing to world No 11 – having started the season ranked 45th – and winning the biggest title of his career at the Paris Masters in November. The Russian N1's success in the French capital, where he defeated four top 10 players including top seed Novak Djokovic in the final, was his third title of the year following wins at the Marseille Open and Kremlin Cup. Spending the off-season “working harder than ever”, Khachanov will continue his preparations for 2019 as part of the six-player MWTC, which takes place December 27-29 at Zayed Sports City’s International Tennis Centre. Khachanov will be joined by the world’s top two players, Djokovic and Nadal. Defending champion and world No 6 Kevin Anderson, French Open finalist Dominic Thiem, and Australian Open semi-finalist Hyeon Chung complete the line-up. Khachanov will take on Thiem in the opening day’s second quarter-final, with the winner to face Djokovic in the semi-final. If he can emulate his Paris Masters result, Khachanov could set up a final meeting with Nadal, who edged out the Russian in a high-quality contest at the US Open in August. Khachanov proved last season that his “best game” was more than a match for the established elite of men’s tennis, and his victory in Paris has given him even more belief in his abilities. “I was really happy to play this kind of final against the best player in the world, and to know I can compete against guys like Roger [Federer], Rafa, Novak, Andy [Murray], Stan [Wawrinka], and [Juan] Del Potro,” he said. “When I was young I was watching them play and now I am competing against them at the highest level."